Long-haul low-cost start-up Indonesia AirAsia X (IAAX) has adjusted its fleet expansion plan for 2015 and 2016 in response to unexpected regulatory challenges. IAAX has finally secured approvals to serve Australia, which it now plans to launch on 18-Mar-2015, but is still seeking to secure approvals from Japan and South Korea while new regulations in Indonesia also pose a potential roadblock. IAAX initially planned to commence operations in Dec-2014 on the Bali-Melbourne route. An unexpected last second setback from the Australian regulator forced IAAX to postpone the Melbourne launch by three months. IAAX ended up shifting gears and commenced operations in Jan-2015 with services to Taiwan, which has a more favourable regulatory environment. But the carrier has since been operating only one weekly flight to Taipei, resulting in an extremely low utilisation rate for its initial fleet of two 377-seat A330-300s. IAAX is now planning to add only one aircraft 2015 and one more aircraft in 2016 although this could change if the regulatory environment becomes more favourable. IAAX was initially established in Jan-2014 as a joint venture between between Malaysia-listed AirAsia X and Indonesian company PT Kirana Anugerah Perkasa (PTKAP). PTKAP owns a majority 51% stake in the start-up. PTKAP is related to Fersindo Nusaperkasa, which owns a 51% stake in short-haul low-cost carrier Indonesia AirAsia (IAA). IAAX became the 22nd LCC in Southeast Asia and sixth LCC with widebody aircraft, joining AirAsia X, Cebu Pacific, Lion Air, Scoot and Thai AirAsia X (TAAX). NokScoot, which is planning to launch in May-2015, will be the seventh LCC in Southeast Asia with widebody aircraft. There are only four other LCCs in the world with medium/long-haul operations – Brazil’s Azul, Australia-based Jetstar, Norwegian and Korean Air subsidiary Jin Air. IAAX is the ninth airline operating under the AirAsia brand and selling under the AirAsia website. It is the third affiliate operating under the AirAsia X sub-brand, joining sister carriers in Malaysia and Thailand. IAAX has had a tumultuous and costly launch phase. The airline initially secured an air operator’s certificate from Indonesia’s DGAC in early Sep-2014. In Oct-2014 it set a 26-Dec-2014 launch date for five weekly flights from Bali to Melbourne and began ticket sales subject to government approvals. IAAX was confident it would be able to secure approvals from Australia’s Civil Aviation Safety Authority (CASA) prior to the planned 26-Dec-2014 launch. The AirAsia and AirAsia X groups were familiar with the process of obtaining a foreign air carrier permit from CASA as two of its existing affiliates, Indonesia AirAsia and Malaysia-based AirAsia X, have served Australia for several years. But the approval process with CASA took significantly longer than expected – and longer than what other LCCs from Southeast Asia have experienced such as Scoot. IAAX indefinitely deferred the launch of services to Melbourne on 25-Dec-2014, or just one day prior to the planned launch. Passengers that had already purchased tickets were refunded or re-ticketed via Kuala Lumpur on flights operated by other AirAsia affiliates, which adds several hours to the journey. AirAsia was finally able to secure approvals from CASA in early Mar-2015. On 5-Mar-2015 IAAX announced it will begin serving Melbourne on 18-Mar-2015 with two weekly flights, increasing to the original planned schedule of five weekly flights from 1-May-2015. Australia is an essential component in the IAAX business plan. The carrier also initially envisioned services to Sydney in the first phase of its network development plan and has been considering Brisbane or Gold Coast as a potential third Australian destination. Bali-Australia is a highly competitive market but there are opportunities for growth. Incumbents would obviously prefer not to see a new entrant in the Bali market, particularly as AirAsia X has the lowest costs per ASK in the world. The Melbourne-Bali and Melbourne-Sydney routes are both already served by Garuda Indonesia, Jetstar Airways and Virgin Australia. Jetstar and Virgin Australia also serve Bali from Brisbane, Perth and Adelaide. 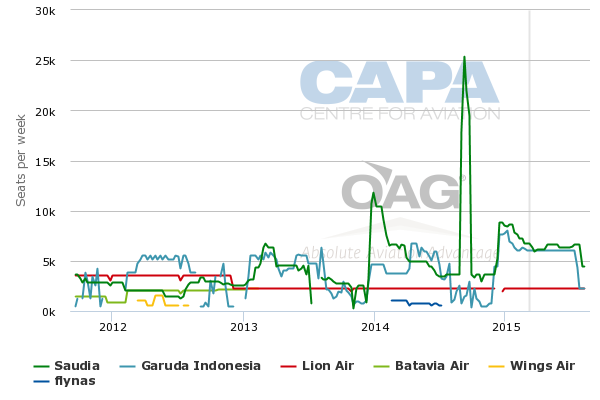 Garuda dropped Bali-Brisbane in Feb-2015 but continues to serve Bali-Perth. Indonesia AirAsia (IAA) also serves the Bali-Perth route, where it is the largest carrier with a nearly 50% share of total seat capacity. IAA also competes against Jetstar in the Bali-Darwin market. Perth and Darwin are within four hours of Bali while Melbourne, Sydney and Brisbane/Gold Coast are well outside the typical four-hour cut-off which separates AirAsia and AirAsia X routes. Overall Jetstar is the largest player in the Bali-Australia market with nearly a 40% share of total seat capacity. AirAsia has a 20% share but this could potentially double if IAAX succeeds at entering multiple Bali-Australia routes. 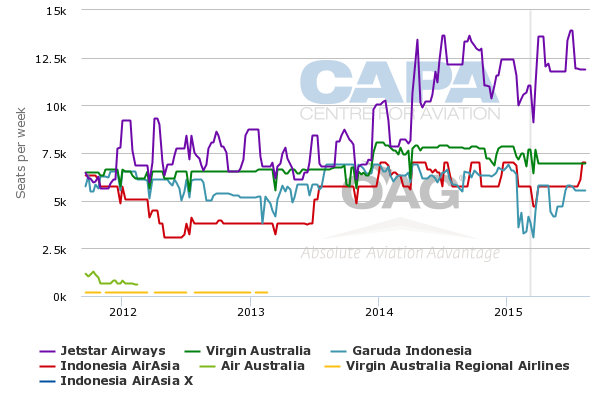 Virgin Australia currently has about a 27% share of non-stop seat capacity between Bali and Australia while Garuda has about a 15% share, according to CAPA and OAG data. While IAAX is now able to proceed with Australia it is seeking to get off the EU blacklist which should help it proceed with plans for South Korea and Japan. IAAX was initially planning to launch with Australia and subsequently add services to Japan and South Korea. Japan and South Korea typically do not permit the launch of services from EU-blacklisted airlines or new airlines from countries which are not in compliance with ICAO standards. For example, Philippine carriers were unable to launch new services to Japan or South Korea for several years until the Philippine authorities finally passed an ICAO audit in 2013. IAAX could potentially serve China as the CAAC does not block EU-blacklisted airlines or new airlines from countries that have not passed an ICAO audit. This is also the case with CASA although such airlines could be scrutinised more closely, which could explain the longer than expected processing time for IAAX's application to Australian authorities. But the CAAC has made it more difficult in recent months for foreign carrier start-ups. As CAPA previously highlighted, Cambodian start-ups have been told by the CAAC they need to be operating at least six months before being considered for a foreign air carrier permit. IAAX is not the only long-haul LCC start-up facing regulatory challenges which are much stiffer than initially anticipated. NokScoot also has had had to repeatedly push back its launch due to a longer than expected process of securing a foreign air carrier permit from Japanese authorities. NokScoot is also now working to secure approvals to serve China and South Korea. NokScoot was aiming to launch services to Japan in early 2015 but never set a launch date as Japanese authorities do not allow an airline to begin ticket sales until it secures approvals while in Australia regulators permit new airlines to begin ticket sales subject to approvals. IAAX is currently one of over 50 Indonesian carriers listed on the EU blacklist. The EU automatically places all new airlines certified by Indonesia on its blacklist of foreign carriers because the Indonesian authorities' regulatory oversight currently does not meet ICAO standards. Airlines are able to get off the blacklist by appealing to the EU and demonstrating they meet international standards. There are five Indonesian carriers that are currently exempt from the EU blacklist including Garuda, Airfast, Mandala (currently not operating), Exspres and Indonesia AirAsia. IAAX should be able to get off the blacklist following the process that its sister short-haul sister carrier succeeded in completing earlier. But the process could take time. Until IAAX is able to get off the blacklist further delays in network expansion are possible. But IAAX and the AirAsia family are optimistic all the remaining regulatory challenges can be overcome - as was the case eventually with Australia. The AirAsia X Group stated in its 4Q2014 results presentation that Japan remains in IAAX’s network plan for 2015 along with Taiwan (already launched), Australia and Saudi Arabia. Taiwan was always in the IAAX business plan but not initially envisioned for the first phase. 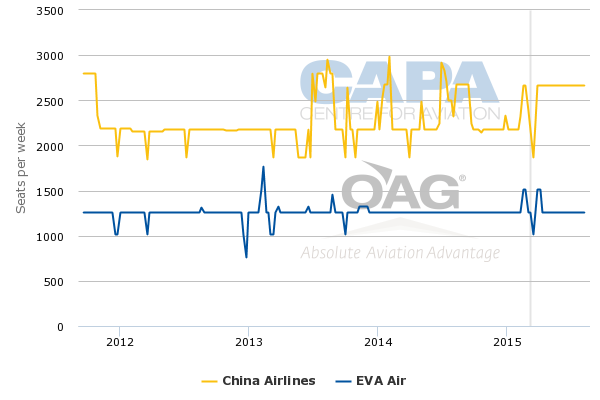 IAAX is now competing against China Airlines (CAL) and EVA Air on the Bali-Taipei route. Both Taiwanese carriers operate widebody aircraft on the route, which is about five hours in duration. While IAAX is the first LCC in this market CAL and EVA have traditionally offered relatively low fares on Bali-Taipei as it is a price sensitive leisure market. Once IAAX upgrades Taipei to four weekly flights it will capture about a 29% share of seat capacity in the Bali-Taiwan market. EVA’s share of capacity will decrease to about 24% and CAL’s share to about 47%. IAAX is currently offering return fares including taxes between Taipei and Bali starting at TWD5600 (USD178). AirAsia sells connections via Kuala Lumpur on those days IAAX does not operate but fares on the one-stop product are about twice as expensive on average. Jeddah in Saudi Arabia was added to the IAAX business plan because as is the case with Taiwan it presents an opportunity without significant regulatory challenges. There is also significant demand between Saudi Arabia and Indonesia, particularly during periods of high demand for religious pilgrimages. The Saudi Arabia-Indonesia market is currently served with non-stop scheduled flights from Garuda, Lion Air and Saudi. Several other carriers serve the market with seasonal charters and one-stop flights. While Lion serves the Jakarta-Jeddah route IAAX will essentially be the only LCC in the Indonesia-Saudi Arabia market with scheduled services. Lion's widebody fleet consists of two infrequently utilised 747-400s which are only used to serve Saudi Arabia on a seasonal basis. The Lion 747-400 operation follows more a leisure/charter model although Lion could potentially adopt more of a long-haul low-cost model in late 2015 when it takes delivery of three A330-300s. The Lion A330s are intended to replace its 747-400s but could open up opportunities to compete against IAAX in more traditional scheduled year-round markets such as North Asia. Saudi Arabian LCC flynas also served the Indonesia market for several months in 2014. But it has dropped services to Jakarta along with its entire medium/long-haul LCC operation. There are currently no non-stop flights from Bali to Saudi Arabia. As Bali is more an inbound leisure destination IAAX is also likely to serve Jeddah from Jakarta or other Indonesian cities such as Surabaya. This will require IAAX to reposition aircraft and crews to other Indonesian airports, something it was initially hoping to avoid by focusing entirely on the Bali-Australia and Bali-North Asia markets. IAAX initially looked at having two bases - Bali and Jakarta - but subsequently decided to focus on Bali as splitting the operation would not be sensible at least in the initial phase. Jakarta also faces slot constraints. While the only IAAX base is at Bali its corporate headquarters is at Jakarta, where it shares an office with sister carrier IAA. IAAX has adopted a more flexible fleet plan as a result of the regulatory challenges and delays. IAAX took both of its A330-300s in 2014 and has now been allocated only one additional aircraft for 2015 followed by only one additional aircraft for 2016. As a result the new version of the AirAsia X Group fleet plan has only four A330-300s for IAAX at the end of 2016 compared to nine for TAAX. Expansion at TAAX has been accelerated as Thailand does not currently face the regulatory constraints of Indonesia. There is also a need for strategic expansion in Thailand because of the upcoming launch of NokScoot. The fleet at the original AirAsia X operation in Malaysia will be slightly reduced in 2015 as part of capacity cuts aimed at turning around the struggling carrier. While 21 aircraft for end-2015 and end-2016 represents a smaller fleet than currently, the Malaysian carrier pursued dramatic and what has proven to be unsustainable growth in 2013 and 2014. Malaysia-based AirAsia X operated a fleet of only nine aircraft at the end of 2012. The group could still look to reaccelerate fleet growth at IAAX should all the current regulatory bottlenecks be overcome. But at the same time the group will be careful not to even release the third aircraft until more authorisations can be secured. The regulatory delays have been costly as IAAX has been paying two aircraft leases and crew costs since Dec-2014. The average aircraft utilisation rate is currently less than one hour per day. This will only improve to almost five hours per day by the end of Mar-2015 as Bali-Taipei route is upgraded to four weekly flights and Bali-Melbourne is finally launched. Planned Umrah flights to Saudi Arabia and upgrading Bali-Melbourne to five weekly flights will improve utilisation further in 2Q2015. But utilisation levels will still be below normal AirAsia X levels. Clearly IAAX needs several more markets to be sustainable. Meanwhile, IAAX also now faces potential regulatory hurdles at home as the new Indonesian government has been planning to start enforcing a rule which requires all scheduled Indonesian airlines to operate at least 10 aircraft including five owned aircraft. This rule was initially established several years ago to raise the barrier to entry but has not been enforced in recent years. Indonesia’s new government initially stated airlines will need to adhere to the regulation from the middle of 2015. But there are indications the implementation will be delayed by at least a few months. Several Indonesian carriers currently do not meet this requirement. IAAX is hopeful it will be exempt from the regulation as it is unreasonable to require an airline that has an all-widebody model to operate 10 aircraft or own five aircraft. Or at the very least IAAX should be given more time to adhere to the regulation as it is only in the initial start-up phase. While most likely it will be postponed or waived entirely, the regulation represents another potential risk to the IAAX business. The new AirAsia X franchise has already had an extremely challenging and frustrating initial few months. There is huge potential for LCCs to penetrate Indonesia’s medium-haul market. As the first Indonesian airline to follow the long-haul low-cost model IAAX should be able to stimulate demand in several key inbound markets, driving growth in visitor numbers to Indonesia. IAAX also will drive passenger growth at Bali as it will connect with domestic and regional international flights operated by its sister carrier IAA. The AirAsia brand already accounts for about 17% of total seat capacity at Bali, including a 20% share of international seat capacity. This will grow as IAAX expands and AirAsia, which recently introduced its Fly-Thru transit product at Bali, starts to use the Indonesian island as a hub for medium/long-haul to short-haul connections. Unfortunately regulatory challenges have become more common over the last several months across the Asian LCC sector. Regulators should recognise the economic benefit of new services and more competition. New airlines which clearly meet the requirements for a local AOC should be given an opportunity to build out their international networks quickly and efficiently. The regulatory challenges being faced by IAAX and other start-ups in Southeast Asia are fundamentally counterproductive and unnecessary.